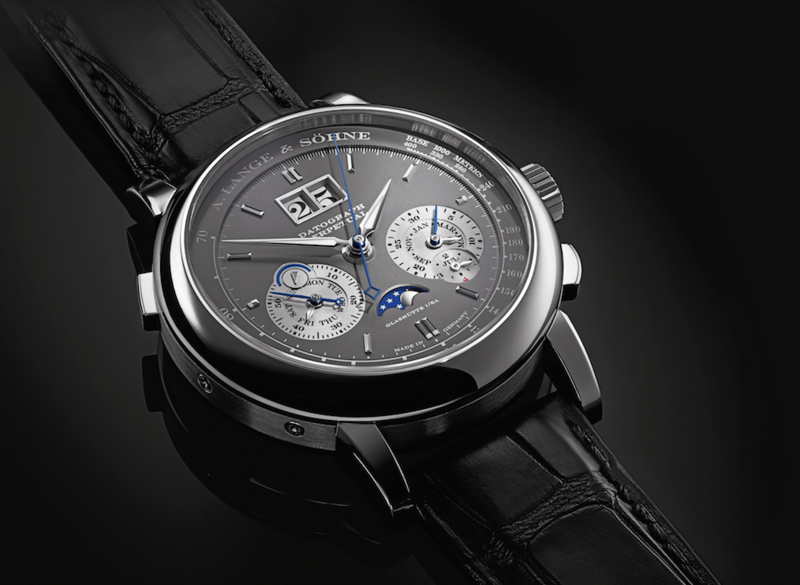 The year’s first batch of time novelties is uncovered at SIHH 2015. The sixteen participating exhibitors: A. Lange & Sohne, Audemars Piguet, Baume & Mercier, Cartier, Greubel Forsey, IWC, Jaeger-LeCoultre, Mont Blanc, Panerai, Parmigiani Fleurier, Piaget, Ralph Lauren, Richard Mille, Roger Dubuis, Vacheron Constantin and Van Cleef & Arpels, seemed to defy the Swiss Franc game by standing their ground and presenting their latest creations to thousands of distributors, business partners and press members. Here is our selection taken from the various new watches. A. Lange & Söhne presented a striking contrast of white gold and grey in its new Datograph Perpetual, emphasizing a bold, elegant design protecting the combination of a flyback chronograph and a perpetual calendar. The watch’s three technically advanced mechanisms, the column-wheel concept, jumping minute counter and flyback system, ensure a dependable control of all chronograph functions, a distinct legibility of stopped times and the accurate measurement of the durations of events in quick succession. The brand extended its Saxonia watch family with the Saxonia, Saxonia Automatic and Saxonia Dual Time, three new models sporting a new dial design that capitalizes and builds on the initial graceful identity with a few cleverly placed accents, all tending to improved legibility. The solid-gold applied hour markers have been moved towards the periphery of the dial and the minute scale’s slightly extended black graduations were enhanced to increase their appearance. The Saxonia Automatic and Saxonia Dual Time’s tens markers of the subsidiary seconds dial now include numerals. Lange also launched its first watch with a decimal minute repeater, the Zeitwerk Minute Repeater, sounding the hours, ten-minute intervals and minutes of the digitally displayed time with the push of a button instead of the conventional slide. In an effort to ensure the repeater sequence is not prematurely interrupted due to the mainspring’s power shortage, its mechanism cannot be activated if the remaining power reserve is less than twelve hours. Baume & Mercier‘s new Classima, a redesign of the iconic range, targets up-and-coming men and women and offers them what is positioned as their companion on the road to success. Available in steel or two-tone versions, the Classima Men comes in a new 40 mm case fitted with a sapphire crystal case back on all self-winding models, while the Classima Women is a 36.5 mm-diameter mechanical self-winding or quartz model, livened by a sunray guilloché decor, and has exceptional reference with diamond-set dials. 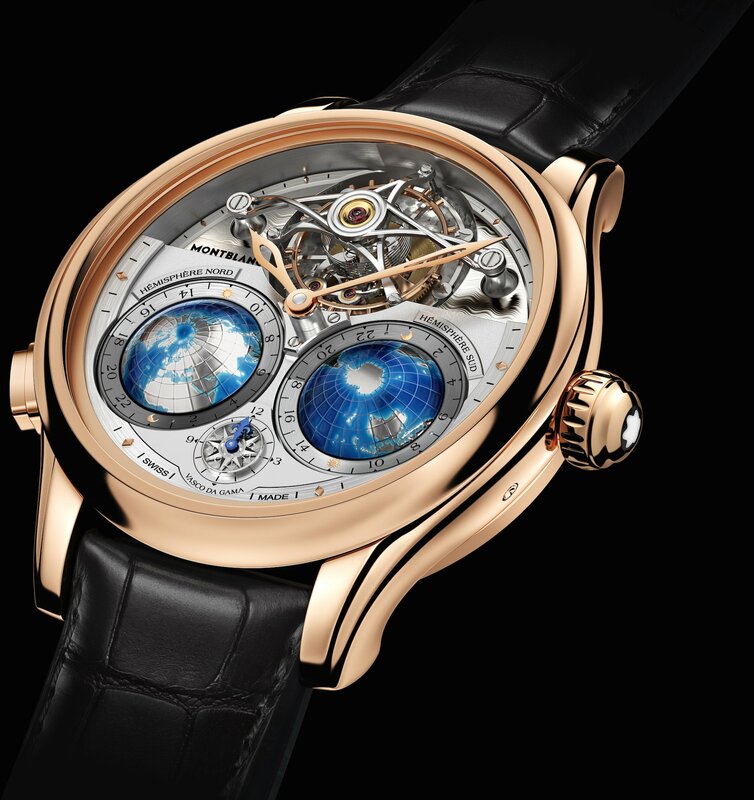 A rather young brand at the SIHH, Greubel Forsey focuses on the link between Art and Science. The Black GMT, treated with vacuum deposited ADLC (amorphous diamond-like carbon), boasts a surface which is significantly harder than natural titanium, and is limited to 22 timepieces worldwide. The dials and indication zones appear to float in space, around the terrestrial globe. The Tourbillon 24 Secondes Vision offers a new and intriguing element, a first for Greubel Forsey, with the tourbillon appearing on the back under a sapphire crystal dome. The fast-rotating 24 second tourbillon complements the graphic composition of the piece; housed in a light-well, it creates an animated scene inviting us to explore the movement-side of the timepiece. The 22 pieces of this limited edition are available in white gold. IWC enlarged its Portugieser line once again with several new models and innovations; the 44.2mm Portugieser Annual Calendar, product of 5 years of research, development and design, represents two firsts for the brand: the newly developed annual calendar closes the gap between the perpetual calendar and the simple date display. A new IWC-manufactured 52850 two barrels calibre keeps the new function supplied with ample energy and ensures a 7-day power reserve. From the Portugieser Perpetual Calendar collection, we singled out the double moon version where the moon phase and its mirror image depict the state of the moon in both the northern and southern hemispheres, offering owners south of the equator a view of the moon phase exactly as they see it. The subdial with the double moon display has become a star-studded night sky with the same color as the large dial, where the moon and stars appear to hover in infinite space. 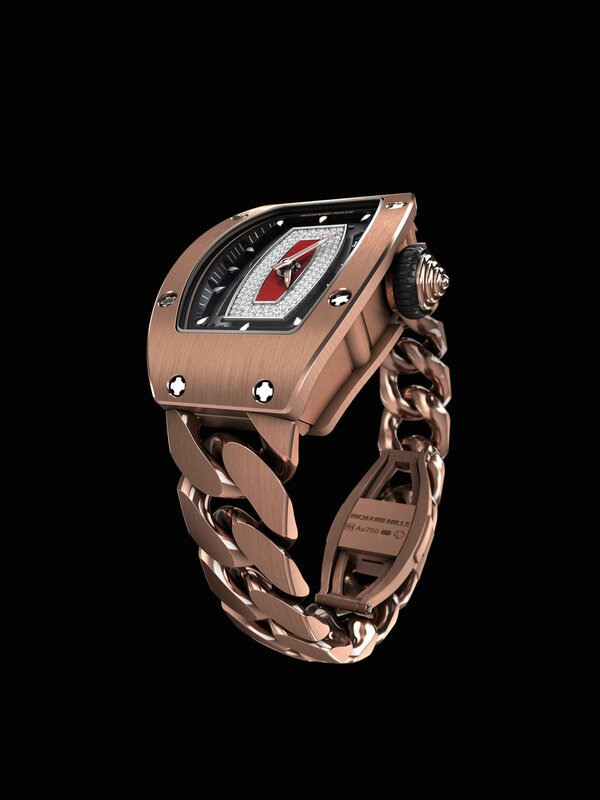 The timepiece is available in 18K white gold or red gold. As we know, many classic moon phases show a one-day discrepancy every 2.5 years. However, Jaeger-LeCoultre strived to solve this issue by properly adjusting the moon phase on its Duomètre Sphérotourbillon Moon, designed to remain accurate for a full 3,887 years; its mechanism allows the small seconds hand to return to zero and restart instantly, without the balance wheel missing a beat, ensuring a precision and timely accuracy. 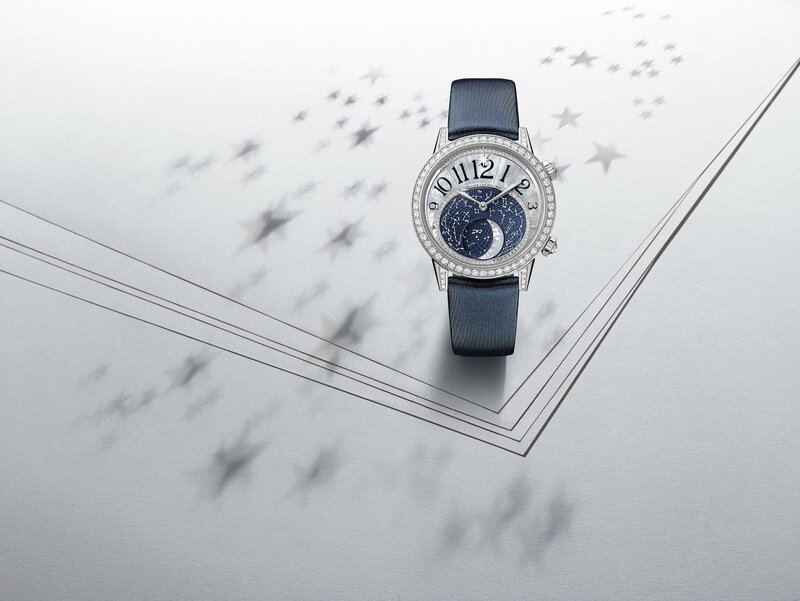 The brand also shared its fascination for the moon with women, with the Rendez-Vous Moon, a feminine moon-phase display of the full moon, new moon, waxing gibbous, first quarter and first crescent. A 36mm version with a mother-of-pearl dial bearing blue numerals and a 166 brilliant-cut diamonds bezel, and a 39mm guillochéd version with 208 diamonds offer ladies an intimate meeting with time. Montblanc explores unchartered territories this year with the Tourbillon Cylindrique Geosphères Vasco da Gama, a timepiece honoring the famous Portugese discoverer’ accuracy and determination. Its 281 component hand-wound tourbillon Calibre MB M68.40 supports various functions: a triple time zone with local time displayed in the form of hours and minutes, a continually running and independently adjustable display for home time seen on a three-dimensional twelve-hour compass rose and 2 globes depicting the world’s 24 time zones in the Northern and Southern hemispheres. The names of 48 cities in both hemispheres are engraved along with the matching time zones on the back of the case, along with the limitation numbers from 01/18 to18/18. Acciaio is an unequaled design by Officine Panerai and is sold exclusively in the historic Florence boutique in Piazza San Giovanni. Hand engraved by expert Italian artisans, the caseband and crown are decorated with geometric shapes, fleurs-de-lys and star shaped flowers, motifs which were often used in Florentine iconography. 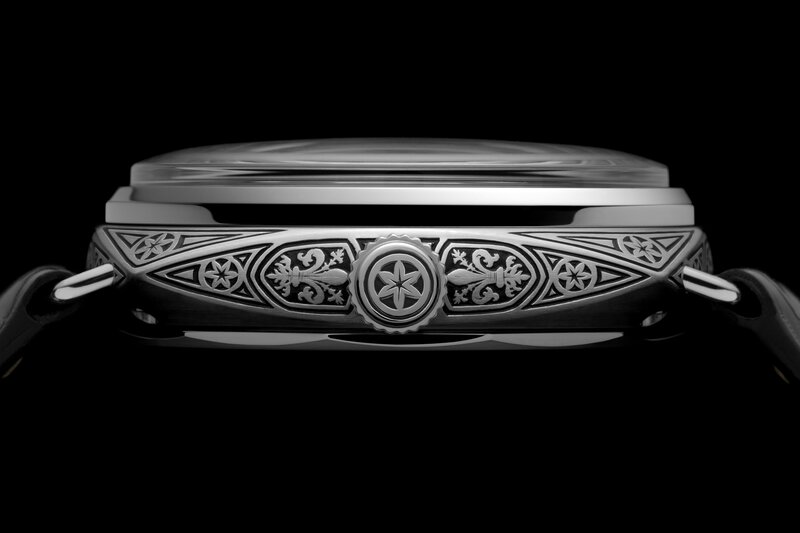 Hand engraving implies the impossibility of exactly replicating the designs, thus making each of the 99 pieces slightly different and unique. The dial’s satiné soleil finish reflects light, creating a luminous aura around the watch. The handwound P.3000 calibre movement can be seen through the sapphire glass porthole at the centre of the back case. The fine work on the Radiomir Firenze proves that hand-work of men is sometimes much more accurate than that of any tool or machine. 1950 Squelette, revealing the watch’s complex mechanism through its platinum micro-rotor, visible on the surface of the watch. The dial on the men’s model is perfectly polished and transparent, showcasing its full technical prowess and detailed movement, and the watch is available in white gold or rose gold with a black or tan Hermès strap. The ladies’ model, on the other hand, features a subtly frosted dial giving off a translucent effect that softens the harsh angles of its movement, and comes in stone-set white gold or rose gold versions, with a red or “ficelle” Hermès strap. The bridge and main plate of the PF705 calibre movement have been open-worked and decorated, and include 127 internal angles. Richard Mille comes back this year with another precious metal bracelet, the Open Link Strap, exclusively designed for the RM 07-01 and RM 037. Each piece of the new bracelet is handmade and hand finished, with micro-blasted, satin-brushed and polished links, offering women a very light, airy and flexible type of bracelet with a more casual appearance, product of lengthy development and testing procedures aiming at a strap with a very ergonomic bracelet. The Open Link Strap definitely falls under one of the brand’s top priorities: comfort. Richard Mille wowed SIHH visitors with the limited edition RM 19-02 Tourbillon Fleur, an impressive magnolia shaped moving tourbillon. Roger Dubuis transported us to a fantasy world with the Excalibur Spider Skeleton Flying Tourbillon, the first-ever watch with skeleton case, hands and flange, combining what are generally viewed as diametrically opposite materials. Choosing the Excalibur range for its legendary connotations and memorable design codes as the pillar for the skeleton theme, Manufacture Roger Dubuis maintained the star-shaped design, the tourbillon carriage shaped like a Celtic cross and the fine finishes including the circular grained plate of hand-wound Calibre RD505SQ. The mysterious black and striking red create a powerful contrast which is enhanced by the 3D effect of the multi-layer approach. Piaget confirmed its reinforced its strength in ultra-thin complication movements with the Emperador Coussin 1270S, the world’s thinnest ultra-thin tourbillon automatic skeleton watch with a case thickness of 8.85mm only. A cushion-shaped ultra-thin (5.05 mm) tourbillon automatic skeleton Calibre 1270S was designed and developed to fit the cushion-shaped case housing it. With a modern and sophisticated white gold version, and a more classic pink gold interpretation with a movement entirely made of gold, the watch took 3 years to develop, as it accommodates 225 parts within an area of barely 5.05mm and boasts a skeleton-work that ensures impeccable operation. with the Métiers d’Art Mécaniques Gravées, two timepieces distinguished by movements that are entirely hand-engraved, maintaining classic ornamental watchmaking traditions. The plates and bridges of the hand-wound 2260 and 4400 calibers are adorned with delicate floral motifs, and the movements feature traditional tone-on-tone decors; a pure, understated design. The Métiers d’Art Mécaniques Gravées 14-day tourbillon is set within a 41 mm-diameter round case in 950 platinum and its engraved 2660/1 caliber is a mechanical hand-wound tourbillon movement with an exceptional 14-day power reserve. The other version, with its hand-wound and hand-engraved Caliber 4400, is hosted in a 9mm-diameter round case with a concave bezel, and drives hour and minute functions. As such, our selection falls mostly on skeletons and moon phases: complex, intriguing and fascinating movements and complications that took the lead in the 2015 edition of the SIHH. With the year off to a rather classic but technically advanced start, we can’t wait to see what’s coming next!